No matter where you get them, (grocery store, thrift store, department store), they seemed to start to pile up. Before you throw them away start reusing those plastic bags. That can be one of the ways you can help save the environment and your money. 1. Baby diapers - they are great to dispose of baby diapers (you know the kind). Since we have been watching our beautiful grandbaby this is now where the majority of our trash bags go. 2. Small trash can liners like in the bathroom or office. 3. Vegetable peelings- Instead of standing over the trash you can just put your vegetable peelings in a plastic bag. Peel as you are sitting down. Also makes it nice to go out to the compost bin with a bag. 4. Save them for when you shop at Aldi's. Although I now keep reusable bags in my trunk ready for a grocery shopping trip sometimes I do not have enough. Some stores will even give you credit (usually around .5 cents per bag) for each bag you bring to their store to pack your groceries in. 5. Trash- My sister and her husband never use a trash bag. Can you imagine? They make use of every small plastic bag that comes their way. We reuse the big ones like you might receive at larger stores in our trash can. If you have a hard time getting those to stay like me these trash can rubber bands come in handy. 6. Easter - Plastic bags come in handy for Easter egg hunts We were so lucky to have a good stack of grocery bags on Easter Sunday for the kids that didn't have a Easter basket. 8. Keep a lid on a (cooled) slow cooker. Ever worry about keeping your lid on your slow cooker (cooled) when bringing it back from a party? A plastic bag comes in handy for a last minute fix. Put one handle of the grocery bag on the handle of the crock pot and twist it over the top to the other handle of the crock pot. It will help the lid stay on till you get home. 9. For your rummage sale. It's always great to be able to offer your customers a bag for their goods! 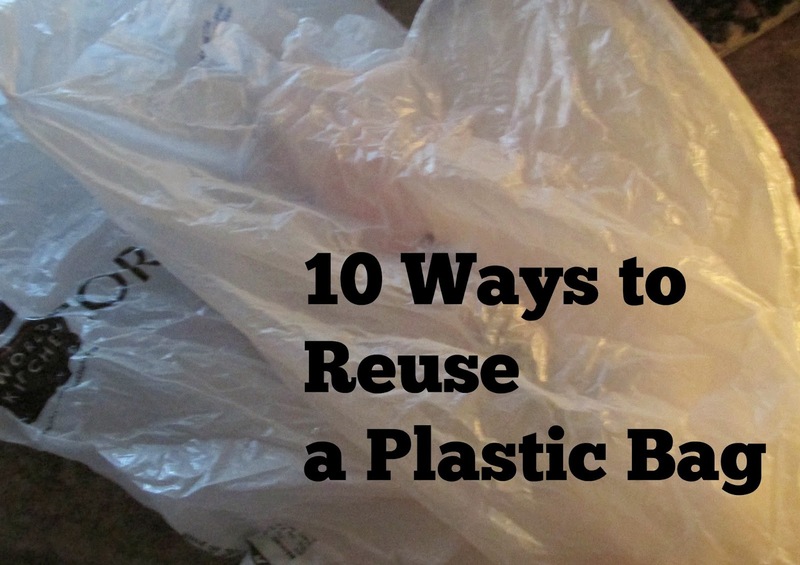 What ways do you reuse a plastic bag?